drakendark on I die, you die, we all die, bye bye! until you're more familiar with the competitive formats, i'd probably just label decks as "casual" when choosing the format. firstly, you want to maximize your chances of drawing or searching your Dark Depths and Vampire Hexmage . max out your Sylvan Scrying , and add Expedition Map . the only thing i can think of that would reliably tutor out the hexmage is Muddle the Mixture , but at least it also helps protect you while you assemble the combo. "cantrips" such as Opt and Serum Visions also speed you towards your combos. i'd also recommend more dual lands, mainly fetch lands like Polluted Delta and shock lands like Overgrown Tomb . Not of This World will be really hard to cast unless an opponent is targeting your Marit Lage token, but other counterspells like Counterspell and Mana Leak are always useful. 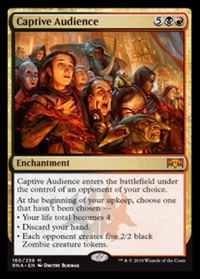 other options in your colors for controlling an opponent (to protect yourself and your combo) include Thoughtseize and Inquisition of Kozilek to pick off any removal spells that can get around Indestructible, and Abrupt Decay or Assassin's Trophy to remove almost any problem permanent an opponent may have already resolved. since Essence Harvest and Rite of Consumption are sorceries, they can't be used in response to an opponents removal (such as a Path to Exile , which gets around "indestructible"). a Marit Lage token can generally just win by attacking anyway. I think you may want to consider including creatures with Shadow. 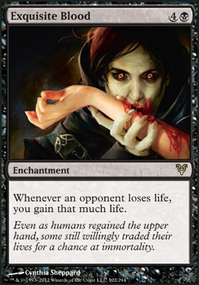 Dauthi Horror , for example, costs the same as Nezumi Cutthroat , but your opponent is probably less likely to have a creature with Shadow than a black/artifact creature. 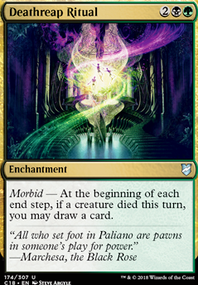 Giving your creatures Infect through Phyresis or Tainted Strike might also be nice, but you need them early for them to be useful. Rite of Consumption / Essence Harvest are good as a finishing move for a deck like this. I personally prefer Enchantments over Instants, and if they're Auras, they have nice synergy with Aura Gnarlid . Basically just throwing out ideas from my own Pauper deck... Rite of Consumption / Essence Harvest could also work well to get around blockers, although I always feel that the latter is too expensive for a fast deck like this. This looks far better; we have a defined theme now and I see some more staples in (dorks). However I'd like to address few likely weak spots. First thing that got my attention was the relatively high average cmc. This is a casual deck and higher-than-usual avg cmc is to be expected of course. But in my suggestions I'll keep in mind fostering a healthy curve and prioritize low-cmc cards. Dragon Broodmother- this is a neat, but a very slow engine. If the deck works perfectly as intended, there are still cooler options. Plus 6cmc for such slow effect is a lot. Ghoulcaller Gisa - again, neat but slow. At 5cmc there might be better options available to you. First similar thing that comes to mind is Open the Graves which would give you tokens more reliably (being a triggered rather than an activated ability stapled to an enchantment rather than a creature) and that doesn't have summoning sickness. Huntmaster of the Fells Flip - I'd ask how many Linas do you need per deck but I'm afraid of the answer. Nevertheless, Selvala is covering that field nicely IMHO and this one doesn't cut it in here. Sheoldred, Whispering One - probably the best expensive creature you have. My concern is that in order to get to 7 mana and stay alive long enough for Sheoldred to matter, you must have game in a state where, frankly, SHeoldred isn't much of a factor. Stalking Vengeance seems awfully expensive TBH. That ceiling is something, but IMO it's too greedy. Asceticism - you want your creatures to die, right? YOu just need to keep several important ones alive. At 5 mana you could do better with Autumn's Veil or something along those lines. Fungal Sprouting - cute, but the fact that it's useless when you're down makes it a no no in my eyes. Skullclamp - in here it says ": draw 2 cards". Yes please. Fling/Thud - these effects seem like they could/should be your bread and butter. Worst case scenario they're pw/creature removal with sac outlet. Best case scenario they are capable of taking down players. 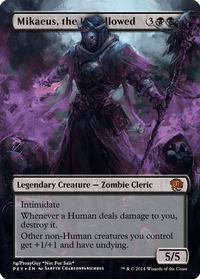 Sidisi, Undead Vizier- tutor on a stick is usually good if you have creatures to sac. In a vacuum it's a Demonic Tutor that gives counters to Kresh. Best case scenario you have a sac outlet and get a complimentary 4/6 deathtouch to fool around with. Smothering Abomination - draw engine on a stick. Seems good. Birthing Pod - it kills stuff plus it tutors. And it's repeatable. What's not to like? Evolutionary Leap - sac outlet that gets you more creatures. I think Essence Harvest is only good, when you're already winning on board and either bad or a dead card, if you're on the losing end. I prefer to play more removal or hand disruption in this case. On the other side Life's Legacy could really be a good green draw spell in some situations. I think I will try freeing a sideboard spot for it. Because when you're playing against removal heavy decks like pyromancer, it could end also as a dead card in hand, when played mainboard. Last_Laugh Thanks! and I like the feel of your deck as well. I ended up stealing a few things and realized I could fit in a nice counter creature package by just cutting 2 cards. As for the other suggestions I dont really want to run that many non permanents and if I had to run any more I would put in Rite of Consumption and Essence Harvest. 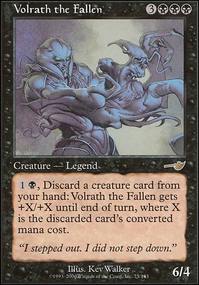 I have looked at Life from the Loam when I was building the deck and it just doesnt do enough since you dont really care where your lands are and there are better cards that fill the dredge factor like Taigam, Sidisi's Hand and Stinkweed Imp who also is a great blocker. Bear Umbra and Sword of Feast and Famine both fit a more aggressive deck like yours and I dont really care if I attack or not unless my Jarad gets exiled. 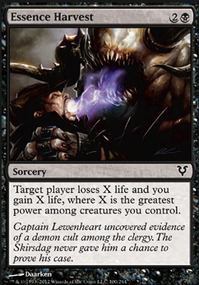 Diabolic Intent is nice but and would fit ok but just no room for another tutor. Pernicious Deed has been in and out of this deck more times than I can count and I have decided that it just slows me down too much to recast everything when I dont really care what they have on their board unless its graveyard hate and also puts a target on my head more then there already is haha. All in all though thanks for the suggestions since they made me take a step back and put a few new things in!